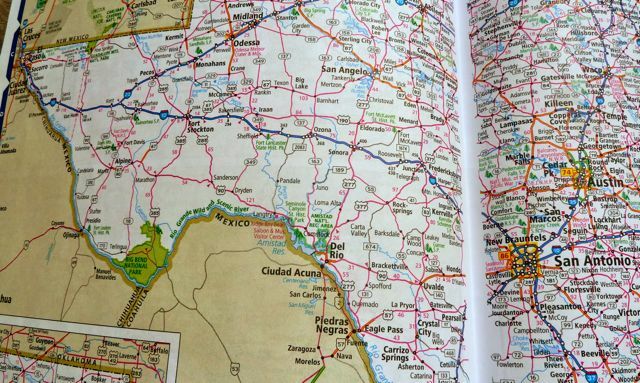 The drive from El Paso to San Antonio is the longest drive of our trip. It's over 500 miles in total. 500 miles with no cities or landmarks along the way. Not exactly a pleasant experience. And the landscape is really uninspiring. Our couchsurfing host in El Paso is in the army, so he had to be up and out to work by 6am, which meant that Ueli and I had an early start. This is a good thing, though, because it allowed us to climb a nearby mountain and watch the sun rise over El Paso and Juarez. We then drove through downtown El Paso and to the border crossing, with hundreds of people lined up to enter the US. I can't imagine having to endure the de-humanizing experience of passing through US customs everyday, but somehow thousands of people do it everyday. The sun was shining brightly at 7:30am as we left El Paso. 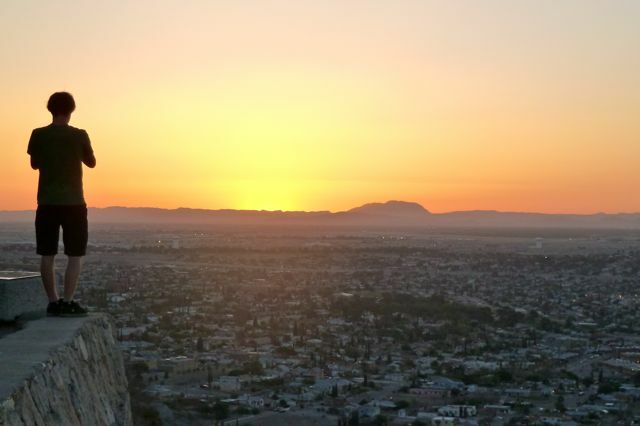 There are about 1 million people in El Paso, and 1.5 over the border in Juarez. The city is large enough to have several radio stations that we were able to listen to, each with their morning mix of music and talk. The traffic reports on the radio discussed traffic jams that are simply laughable compared to what I'm experience in LA. They also report the wait times at each of the border crossings from Mexico. About half and hour out of El Paso, we stopped at a McDonald's to use their free wifi (which is a very useful travel tip when you're on the road!). Another hour or so into the drive, the 10 turned, leaving the Mexican border behind. So, we passed through an immigration checkpoint where the police officers told us to pull over and show them our passports. My first reaction was to feel somewhat violated. Anyway, I had to pull my passport out of the car's trunk. The fold-out map on the seat of the car was blown out by the wind. It was frustrating, and for the first time on this trip, I felt homesick. The sun was hot. Ueli drove for a couple hundred miles; I was half asleep for most of the ride. One of the warning lights came on the car, but it was just for fuel efficiency or something unimportant. The landscape transitioned from desert into scrubland, with more green shrubs all around. For some reason this is how I imagine Australia or east Africa looks like (minus the kangaroos and lions). Oil pumps began appearing on either side of the freeway. We stopped at a rest stop and I took over the driving. Another 4 hours to go. I kept myself awake and aware by eating one grape each time I passed a mile marker. 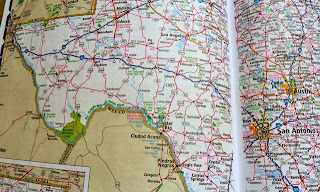 We reached the town of Junction, about 100 miles from San Antonio, and stopped for gas. When I opened the door, a powerful breeze filled the car with searing hot, steamy, humid air from outside. I was taken aback. We were no longer in the desert. Somewhere in the last few hours, we had left the desert Southwest behind and had entered the muggy American South. Anyway, air conditioning in the car just barely good enough to keep us from succumbing to heat stroke. It was 4:30pm as we entered San Antonio, the Alamo City. Our couchsurfing hosts were a young married couple and were awaiting our arrival. We headed straight for their apartment, which is a nice luxury furnished apartment in a big suburban complex. After dropping off our things, we joined our host, who showed us around. She (and her husband) were new to the city and so were eager to see new things themselves. It was Tuesday, and on Tuesdays, the San Antonio Museum of Art has free admission after 4pm. Along the way there, we made an unplanned detour by the Alamo. We arrived at the museum (I continued to be impressed by the intensity of the heat every time I got out of the car), and we met one of our hosts' cousins and his female friend who were both anthropologists (and as such, they were interested in many of the historic artifacts in the museum). The museum was showcased an exhibition inspired by Buddhist teachings in addition to their regular collection of Greek and Egyptian artifacts. The five of us then drove to The Cove, a wonderful bar/restaurant/beergarden/children's playground/car wash (no, really - it is!). It's run by a bunch of Texan hipsters, as oxymoronic as that sounds, which is not a bad thing: They serve grass-fed beef and bison. I definitely enjoyed it. We sat at an outdoor picnic table and put back a couple beers in the warm late afternoon sun. As the sun set, we headed home, stopping by H-E-B Plus, a massive supermarket, warehouse size. We bought some beers and picked up our other host as he walked down the street returning from work. A few more beers and some good conversation followed, and by the end of it all, we had worn ourselves out. I took the couch and Ueli slept in the guest room.